Kauai is the oldest of the major Hawaiian Islands. It is the fourth largest of the main islands in the Hawaiian archipelago. Known also as the “Garden Isle”, Kauai lies 105 miles across the Kauai Channel, northwest of the island of Oahu. We have told people that we are not coming to Hawaii to lie in the sun and sip maitais by the pool. 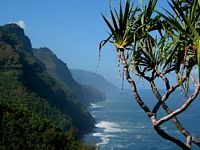 We have told them that we are here to experience the activities of the island of Kauai and to do a little hiking on the infamous Kalalau Trail. No one believed a word of it. Today we will undertake a very short (4 miles) but incredibly rugged section of the trail. The whole trail runs from Ke’e Beach to the beautiful Kalalau Valley, a distance of 11 miles. The Kalalau Valley is located on the northwest side of the island. The valley is located in the Na Pali Coast State Park. The Na Pali Coast is very rugged and can only be accessed by kayak or by hiking the Kalalau Trail. The valley is renowned for its natural beauty; it is surrounded by lush cliffs more than 2,000 feet (610 m) high. Many native Hawaiians lived in the valley into the 20th century, but today, its designation as a state park forbids any one from residing there. A limited number of permits are issued for camping in the Kalalau Valley every year. We were not prepared and did not have the necessary time for overnight camping. Our intention was to enjoy the first part of the trail between Ke’e Beach and Hanakapi’ai Beach. We were informed that the trail was very rugged and had no desire to make it even more difficult by packing camping equipment with us. A simple day pack and camera equipment was all I was willing to carry. Before going to the trail we did stop at the lookout at Koke’e State Park. This is accessible by road from the west side of the island and affords a stunning view of the valley. 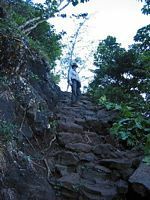 There is a rumour that there is a trail accessing the valley from Koke’e, however, it is also rumoured that all possible routes are very dangerous and people have fallen to their deaths trying to find them. 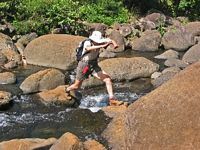 With this information, real or not, at our disposal we decided to stick with the mapped Kalalau Trail. I can get myself into enough trouble without resorting to urban legends thank you. Although we would only be undertaking a 4 mile stretch, there and back, we had educated ourselves prior to our expedition and were aware of the difficulty we faced. Little did I know that above and beyond this there would be a frustration factor that would try my tiny reserve of patience. The trail starts on the north shore of the island where the main highway ends at Ke’e Beach. We had a bit of difficulty finding the beach but ultimately followed the highway and found it just stops at the beach. This is the only land access to the Na Pali Coast State Park. The beach itself is very attractive as it is situated on a unique reef lagoon which is quite suitable for swimming and snorkeling. 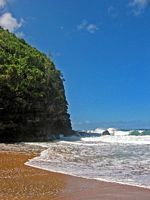 Many beaches on Kauai, although gorgeous, do not offer the same degree of safety in their waters. Strong currents, rip tides and large waves make many beaches unsafe for swimming. From Ke’e Beach the trail rises fairly steeply for the first mile. It’s a tough climb as you go up about 1000 feet over this first mile. The path is not easy. Large boulders, very uneven, rocky ground and wet muddy trails. This concoction of terrain is a very bad combination. Slippery when wet and it’s always wet somewhere. Be sure you’ve got some good sturdy shoes or hiking boots on this trail. This is not something you want to attempt in running shoes or sandals. For all the misstepping, stumbling, slipping, near turning of ankles and general overall hardships (remember that frustration I mentioned earlier), any inconvenience is quickly forgiven with the magnificent view of the Na Pali Cliffs that you get at every bend in the trail. Given the aforementioned topography be forewarned that descending on the trail is even more hazardous. As I try to navigate safely the excruciating pain in my knees reminded me of our Peru adventure on the Inca Trail last year. There were a few slips and falls for me as we made our way down. Two of these falls were caused by my boots locking together at the lace hooks. I came extremely close to throwing my boots off the cliff in shear frustration, but calmed by the incredible vistas before me we made our way down to Hanakapi’ai Beach at the two mile mark. As we neared the bottom we were confronted by a sign that warned of the devastating waves and undertows and was graphically illustrated with strokes marking the number of deaths that have occurred as a result of ignoring the warning. It certainly gets your attention. Kauai’s geography makes Hanakapi’ai Beach, in a word, treacherous. During the summer month’s the beach’s sandy shoreline is clearly visible. But during the winter months, which we were rapidly approaching here in October, dangerous, powerful waves and high tides wash away that beautiful sandy shore. Hanakapi’ai Beach is a popular tourist attraction for the hardy souls wishing to undergo the hike in as there is no road access. However, like many beaches along the Na Pali Coast, strong rip currents and rip tides, high surf and crushing, breaking waves make it extremely perilous. This coast is especially treacherous because there are no major reefs to alter the dangerous ocean currents. Kauai’s basic geography makes it even more hazardous. In the event that one gets caught in a rip tide or current and swept out to sea the nearest safe shore area is approximately six miles away. There have been confirmed cases of weary hikers wading in the water to relax themselves after the arduous two mile trek and being swept away by large waves. Some of these bodies have never been recovered because of the powerful currents in the region. Hence the sign. From that point it is an obstacle course across the boulders that dot the river (it’s soaker time) and we’re on the beach. The surf is indeed awesome here. This is definitely not a beach at which you could even THINK of swimming. The view is awe inspiring and it is complemented by the sound of the roaring surf and the crashing waves as nature puts on a show you will not soon forget. The hike back was a little worse. I have to wonder why because it was the same trail we took coming in but this time we were going up where we went down the first time and vice versa. I suppose the spray from the ocean ends up on the trail as well. At any rate it was much more slippery and muddy, my boots kept locking together and tripping me and this time the spectacular scenes were behind us and out of view. I guess our one view of wildlife was an omen. Stretched between the leaves of the plants immediately beside the trail was a spider web housing the most enormous spider I have ever had the misfortune of seeing. It was easily the size of my hand with fingers fully extended and splayed. Thank goodness there was a girl taking a picture of it or I’d have walked right into the web. This must have been a very recent construction because it certainly was not here on our way in this morning. It’s not the kind of thing that we would have passed by and not seen. You couldn’t – it hung in a narrow area of the path and partially blocked it. As uncomfortable as I was doing it, I took a photograph then skirted gingerly through the brush around the visitor. I don’t know if it was venomous or not and was not about to stick around to find out. We arrived back at Ke’e Beach relatively unscathed considering what was at times a real ordeal. Soaking wet and covered in red mud from head to foot, you’d think we just journeyed through a tropical monsoon. Even so, the hike was well worth every sometimes painful step. The views along the Kalalau Trail will at times take your breath away and Hanakapi’ai Beach has to be seen to be believed. It was only a four mile trek but I’d stack it up against any 10 I’ve done to date for great difficulty yielding great scenic reward.